Kathleen Mary Griffin was born on 4 November 1960, in Oak Park, Illinois USA, to Irish immigrants, and is a comedian, television and film producer, actress, as well as a voice actress. 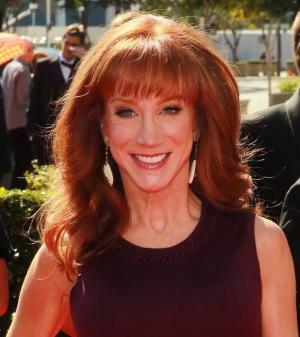 To the audience, Kathy is perhaps best known for her reality television series called “Kathy Griffin: My Life on the D-List”, which made its debut in 2005 and finished its six season run in 2010, and which primarily focused on Kathy Griffin and her struggles to become a celebrity in Hollywood. Kathy’s show not only won Primetime Emmy Awards and 19th GLAAD Media Awards, but certainly helped to establish her as an actress in the entertainment industry. An award-winning comedian and an actress, how rich is Kathy Griffin? Sources estimate that Kathy’s net worth is over $20 million, mostly coming from her appearances as an actress, as well as a stand-up comedian during a career which began in the early 1980s. Kathy Griffin studied at Oak Park, and River Forest High School, where she took part in many theatrical productions, which later helped her decide about pursuing an acting career. Even though her parents were rather hesitant about her career choice, Griffin convinced them to let her move to Los Angeles, where she had more acting opportunities, and after arriving Kathy joined an improvisational and sketch comedy sketch troupe called The Groundlings, with whom she performed at various comedy clubs. It was with The Groundlings that Griffin was able to launch what became a successful career as a stand-up comedian. In addition to her own reality series, Kathy Griffin has made numerous appearances on the big screen, making her debut in Jimmy T. Murakami’s science fiction film “Battle Beyond the Stars” playing an alien extra, then had her first major role in Bobcat Goldthwait’s film called “Shakes the Clown”, portraying the character of Lucy, then appeared in Quentin Tarantino’s “Pulp Fiction” with John Travolta, Samuel L. Jackson and Uma Thurman, “Shakes the Clown” with Robin Williams, and “Suddenly Susan” with Brooke Shields to name a few, which steadily improved her net worth. Kathy Griffin is also notable for her stand-up comedy specials, such as “Hot Cup of Talk”, “Strong Black Woman”, “Balls of Steel”, and more recently “Calm Down Gurrl” and “Record Breaker”. Kathy Griffin has also released several comedy albums, one of which, namely “For Your Consideration”, topped the Billboard Top Comedy Albums chart and earned her a nomination for a Grammy Award. Kathy Griffin has also continued making appearances both on stage and in front of the cameras; she is known for appearing in several popular sitcoms, including “The Fresh Prince of Bel-Air” with Will Smith, “ER”, “Seinfeld”, “Law and Order Special Victims Unit” and “Days of Our Lives” among many others, being consistently in work, and steadily adding to her net worth. Kathy has now appeared in over 40 films, and more than 70 TV productions. In her personal life, Kathy has undergone various eye and plastic surgery operations, which she is somewhat reticent about discussing. She was married to Matt Moline from 2001 to 2006, since when she has dated Steve Wozniak – Apple co-founder – actors Levi Johnson and Isaiah Mustafa, and her tour manager Tom Vize. She has been in a relationship with Randy Bick, a marketing executive, since 2012. They currently live in Bel Air, California. 1 I was raised right - I talk about people behind their backs. 2 "Honestly, you know, after David's death, we weren't nearly as invested in the show." (On how she and her Suddenly Susan (1996) colleagues were affected by the suicide of their co-star David Strickland). 1 Was a member of The Groundlings. 2 Was in a brief relationship with director Quentin Tarantino in 1995. She appears as herself in his film Pulp Fiction (1994). 3 Studied drama at the Lee Strasberg Theatre and Film Institute in Los Angeles. 4 On January 26, 2014, her album, Calm Down Gurrl, won the Grammy Award for Best Comedy Album at the 56th Grammy Awards. She is only the third woman to have won the award, the others being Lily Tomlin and Whoopi Goldberg. 5 In 2011, she also became the first comedian to have four televised specials in a year. 6 Holds the record for the highest number of specials recorded by a comedian for any network: sixteen, for the Bravo network. She also recorded a special for HBO in 1998. 7 Acting protégée of Joan Rivers. 9 Received a Golden Palm Star on the Palm Springs Walk of Fame on March 7, 2009. 10 Ex-sister-in-law of Rebecca Moline. 11 Ranked #21 on the TV Guide Network special, Funniest Women on TV (2011). 12 Won a 'Do Something' Award for a comedian who makes an impact in the world of social change. Her achievements include: having a pap smear poolside at a hotel in Westwood as part of her "Smear Campaign" to raise awareness for cervical cancer; and for speaking out against the Don't Ask Don't Tell policy. 13 She has a strict no-apology policy with her comedy and routinely refuses to offer apologies when requested by her employers. Her only exception was to (barely) apologize to US Representative James Clyburn after referring to him as a "queen" in an interview with Roll Call. As documented on her reality series, Griffin phoned Clyburn's office with an apology but said to only relay it if her comment "came up". 14 Recounted her guest appearance on the Seinfeld (1989) episode, Seinfeld: The Doll (1996), during a stand-up performance on HBO Comedy Half-Hour: Kathy Griffin (1996), where she ridiculed star Jerry Seinfeld for being rude to her. Seinfeld was so amused by this, that he wrote her a humorous letter congratulating her for it (reprinted in her memoir, "Official Book Club Selection"), added the clip as well as a clip of her being interviewed about the incident by Conan O'Brien to a video shown to audiences at Seinfeld (1989) tapings and had Griffin return for a second episode, Seinfeld: The Cartoon (1998), for a storyline inspired by the incident in which Griffin's character becomes a comedian who makes a career out of bashing Jerry. The two have remained friendly in the years since. 15 Friends with Catherine Bell and CNN's Anderson Cooper. 16 Younger sister of Kenny Griffin, John Griffin, Joyce Griffin and Gary Griffin. 17 Auditioned for the role of Phoebe Buffay on Friends (1994), which went to Lisa Kudrow. 18 As of 2009, a member of the Television Academy of Arts and Sciences. 19 Considered as a possible replacement co-host on The View (1997). 20 Attended Triton Junior College in River Grove, Illinois for one semester. 21 She does not drink alcoholic beverages. 22 Drives a light blue 2004 Mercedes CLK320. 23 Is close friends with actor Jonathan Bennett. 24 Her parents are John Griffin and Maggie Griffin. 25 May 2005 - Having a second surgery for an epithelial ingrowth in her right eye, a rare condition that threatens her eyesight. 26 Notorious for making fun of other celebrities. 27 Suddenly Susan (1996) co-star Brooke Shields was Kathy's Maid of Honor at her wedding, which was held atop Hollywood's 360-Degrees Restaurant. 28 23 September 2000 - Became engaged to computer technician Matt Moline in Punta Mita, Mexico. They were married February 18, 2001. 29 Has appeared in rapper Eminem's music video "The Real Slim Shady". 2014 Grammy Grammy Awards Best Comedy Album For the album "Calm Down Gurrl." 2013 Grammy Grammy Awards Best Comedy Album For "Kathy Griffin: Seaman 1st Class." 2012 Grammy Grammy Awards Best Comedy Album For the album "Kathy Griffin: 50 & Not Pregnant." 2010 Grammy Grammy Awards Best Comedy Album For the album "Suckin' It For the Holidays."